Editor's Note: Have you witnessed the events in Norway? What is the mood like in the country? Share your images, videos and personal accounts with CNN iReport. Please do not expose yourself to a risky or potentially dangerous situation. Oslo, Norway (CNN) -- Police in Norway have not ruled out the possibility that more than one person was involved in Friday's twin attacks that left at least 92 dead, officials said Saturday. "We're not sure it's just one person... based on statements from witnesses, we think there may be more," Acting Police Chief Sveinung Sponheim said. A 32-year-old Norwegian was arrested and charged with terrorism, but police have not officially released his name. Local media has identified the man as Anders Behring Breivik, who has been described as a right-wing Christian fundamentalist. "It's very difficult at this point to say whether he was acting alone or whether he was acting as part of a larger network," Sponheim said. The suspect has been talking to authorities, but Sponheim described the day-long interrogations as "difficult." At least four people are still missing, he said, as investigators continued to search for bodies of victims of the bomb attack in downtown Oslo. The fragility of the damaged structures have made it a slow process, he said. "We know that there are remains of bodies in the ruins of the buildings. And it's a bit of a jigsaw puzzle and a very difficult search. There are body parts in the buildings," Sponheim said. Seven have been confirmed dead from the bomb attack. Police said that the explosive was in a car. 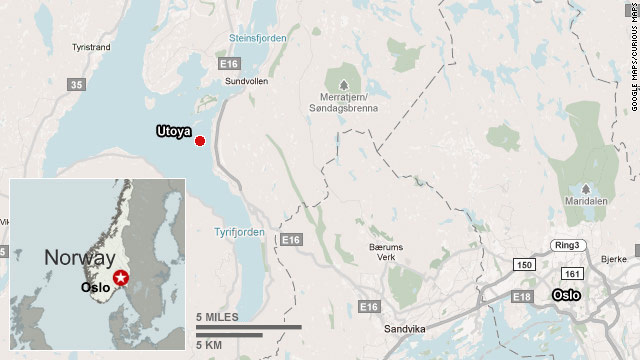 At least 85 others were killed in a shooting at a youth camp in nearby Utoya island. Norway's prime minister called it the country's worst atrocity since World War II. Norway's King Harald also spoke in a televised address. "There is still a lot that we do not know about yesterday's situations," he said. "This we do know, that the situations in Utoya and Oslo is an attack on the nation. It's an attack on the core of the Norwegian democracy." Official sources and social media indicate that Breivik might be a right-wing Christian fundamentalist who may have had an issue with Norway's multi-cultural society. The attack may have been politically motivated, one official said. "I think what we have seen today is that politically motivated violence poses a threat to society and I commend the police for carrying out a very swift and effective investigation, but that is still ongoing," Foreign Minister Jonas Gahr Store told reporters. Who's reponsible for Oslo attack? Other new details emerged Saturday about the attacks. An employee at a Norwegian agricultural cooperative told CNN that the man identified in media reports as the suspect bought six tons of fertilizer from her company in May. Oddmy Estenstad, of Felleskjopet Agr, said she did not think the order was strange at the time because the suspect has a farm, but after Friday's explosion in Norway's capital, Oslo, she called police because she knew the material can be used to make bombs. "We are very shocked that this man was connected to our company," said Estenstad. "We are very sad about what happened." Prime Minister Jens Stoltenberg said Saturday that many world leaders had reached out to him after the tragedy. "The world is with Norway at the moment. That will not restore the lives lost, of course, but it gives support and they hope it will help in their grief," he said. The prime minister said it's too early to tell how the massacre will change Norwegian society. "But I hope we will maintain" the things that make us unique, Stoltenberg said. Together with Norway's king, queen and crown prince, Stoltenberg visited with victims' family members and survivors of the attacks at a hotel. It was while authorities were searching for survivors of the mid-afternoon bombing that a man wearing a police uniform and identifying himself as an officer arrived by boat at Utoya island, about 20 miles from Oslo, where word was spreading among the campers about the explosion in the capital, said Adrian Pracon, a survivor of the mass shooting. The man asked to address the group, and then started shooting. According to police, the gunman was active and shooting for an hour and a half before authorities arrived. He used at least one automatic weapon and one handgun, police said. What followed, Pracon says, was panic and chaos as some campers ran from the shooter, while others went toward the man because they believed it was a drill or a test. Pracon said the shooter chased people to the shore, screaming at them as he fired. An elite police unit took the gunman into custody on the island, police said. The man did not put up a fight during his arrest, he said. Authorities were searching the waters Saturday around Utoya, looking for the bodies of campers who may have drowned trying to swim to safety, police said. "This happened at a place where I, in my young side, became politically active and I said earlier today it was a paradise for youngsters and yesterday it was turned into a hell. We have to regain this. Nobody's going to take this away from us," Stoltenberg said. CNN's Jack Maddox, Chelsea J. Carter, Holly Yan, Laura Smith-Spark, Joe Sterling, Moni Basu, Chelsea Bailey, Claudia Rebaza, Mishan Afsari and Cynthia Wamwayi contributed to this report.